Today's Amazon deal offers a cheap and easy way to add voice control to your non-Alexa speakers. For a limited time, Amazon has its Echo Input on sale for $19.99. That's $15 off and the lowest price we've seen for this device. 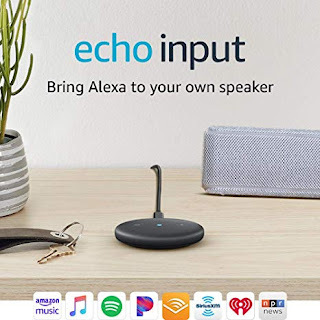 The Echo Input connects to any speaker via its 3.5mm jack or Bluetooth. Once connected and set up via the Alexa app (Android and iOS), you can ask Alexa to play a song, read the news, or stream from Spotify, Apple Music, Amazon Music, or more. Designwise, the Echo Input is a little larger than the Google Chromecast and is barely noticeable among your stereo setup. It features four built-in microphones with action and mute buttons to control them.